A required component for the conversion of homocysteine to methionine, folic acid supplementation helps promote normal inflammatory response and neurologic function, and offers cardiovascular protection. Found naturally in dark green leafy vegetables, such as spinach and kale, folic acid is a key nutrient that drives methylations requiring pathways in the body. This includes homocysteine recycling, neurotransmitter synthesis, liver detox pathways, DNA synthesis and cell division. Maintaining optimal levels of folic acid is necessary for supporting consistent recycling of homocysteine to methionine. As a key donor of methyl groups, folic acid assists in many metabolic processes, offering cardiovascular protection, neurologic function and promoting a normal inflammatory response. 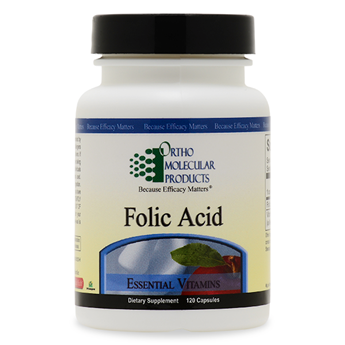 Each capsule of Folic Acid includes 5 mg folic acid and 200 mcg B12 (as methylcobalamin).